Packages of items to optimize installation of an MM Torque-arm. 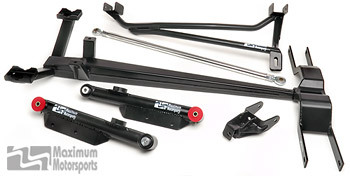 All packages include an MM Torque-arm and MM Panhard Bar. MM Rear Lower Control Arms are options you can add to the packages. Superior design and manufacturing: Built in the U.S.A. These money saving packages give you the choice of no rear lower control arms, both Heavy-Duty and Extreme-Duty non-adjustable rear lower control arms, or adjustable ride height versions of both series rear lower control arms. Additionally, all of these packages are available with either a Standard-Duty torque-arm, or with the Heavy-Duty torque-arm. Packages with the heavy-duty torque arm all have an "H" at the end of the part number that will be visible when you select all of the required options. Heavy-Duty Torque-arm packages are only sold with Extreme-Duty Rear Lower Control Arms.